From NPR’s Science Friday, an interview with the author Steven Strogatz, Professor of Applied Mathematics, Cornell University, on his book The Calculus of Friendship: What a Teacher and a Student Learned About Life While Corresponding About Math. In his new book, Steven Strogatz looks back on the 30-year correspondence he maintained with his high school math teacher. Steve Strogatz also spoke about this relationship with his teacher on Radiolab this past October. Strogatz also is contributing to a column for the New York Times, The Opinionator. the Skiff e-reader, a lightweight device with a 11.5-inch full flexible touchscreen that makes it the largest e-reader on the market, beating the 9.7-inch display Kindle DX. 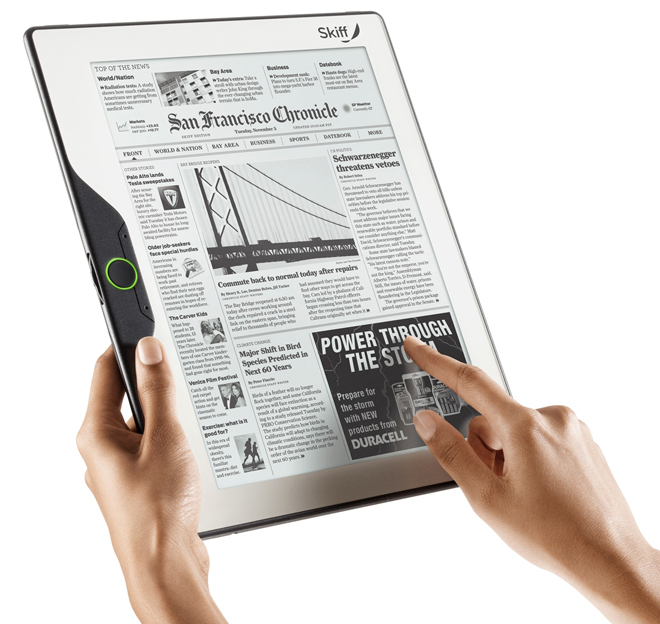 Unlike other e-readers designed for reading mainly books and PDF files, the Skiff is optimized for newspaper and magazine content and will use Sprint’s 3G network to offer wireless connectivity. The device will debut at the Consumer Electronics Show in Las Vegas later this week. The company hasn’t announced availability and pricing for it yet. Electronic book readers are a emerging yet fast growing category of devices. Since the launch of Amazon’s Kindle in 2007, a slew of new devices have entered the market. About five million e-readers were sold last year, estimates research firm iSuppli. Though the Kindle DX is the only e-reader with a screen size larger than the standard 6-inch available in the U.S. currently, more plus sized e-readers are set to hit the market. For instance, Plastic Logic’s Que will have a 8.5-inch by 11-inch screen. At over a quarter-inch in overall height, Skiff’s display will have a resolution of 1200 x 1600 pixels. It weighs just over one pound and offers a week of average use between charges, says the company. The device will have both 3G and Wi-Fi connectivity. Like all other e-readers, Skiff uses the black-and-white display technology developed by E Ink. But the underlying electronics that power the display has been developed by LG. LG has used a sheet of stainless-steel foil for the back of the display, instead of the glass layer that is the the foundation of most e-paper displays available currently. The result is a thinner device that is less likely to break. Skiff’s touchscreen will help users navigate newspapers, magazines, books and other digital content they purchase through the Skiff Store–its own e-reading service. Readers can expect to see visually appealing layouts, high-resolution graphics and other design qualities that would enrich the reading experience, says the company. After all, Skiff has strong roots in the print media. It’s parent company is Hearst, which publishes magazines such as Cosmopolitan, Popular Mechanics and Smart Money. The video-in-print ads will appear in select copies of the US show business magazine Entertainment Weekly. The slim-line screens – around the size of a mobile phone display – also have rechargeable batteries. The chip technology used to store the video – described as similar to that used in singing greeting cards – is activated when the page is turned. The first clips will preview programmes from US TV network CBS and show adverts by the company Pepsi.